I thought I would drop in an do a quick entry. Hope everyone has had a good Holiday Season. My wonderful husband brought me a light tent at Christmas for my card portraits, unfortunately some of the next few entries had already posed without the use of the tent so they have some shadows. The thanks so much is popped up with dimensionals. I am not counting down to Christmas day but my son sure is. I am done shopping and most of the wrapping, I am going to make a couple more batches of cookies but other than that I have been enjoying the copious amounts of snow we have outside. More expected tonight, it is a good thing I have a good stock of cardmaking supplies. I am leaving it down to the wire for a few of my cards, I finished the one for my husband the day before yesterday but I did not take a picture so that one will get posted after Christmas. I was a little wiser with the one for my son though and remembered before I sealed the envelope. Inside this card I printed out the lyrics to Jingle Bell Rock. My son interests involve a lot of music right now, ipod, guitars and guitar lessons, t-shirts with bands on them so when I saw this stamp set I knew it was a must. It may make a couple appearances in the next month or so. This card is an odd shape of 3 x8.5 inches. Supplies: Blue Cardstock, Baby Blue Glitter paper DCWV, Provo Craft Lacey Sky, Inkadinkado Rock Star Clear Stamps, Modern Home ribbon, Stamp’n Stuff Winter Wonderland Embossing Powder, misc jingle bell. 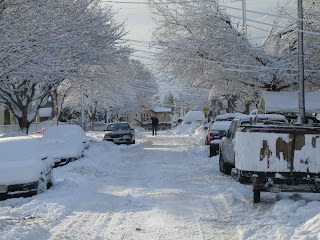 Here are a few snowy images from around our area, snow usually falls and melts quickly here if it falls at all. 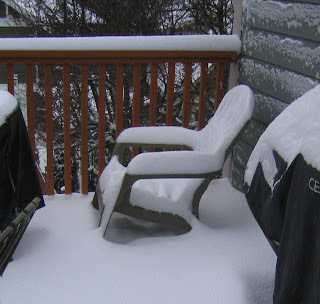 We have around a foot of snow right now and we have had a week of - numbers weather. Winter.. huh.. fancy that. I have to chuckle about with this next photo as that it is a hot tub on the trailer on the right hand side. Sorry for the late post, work has been insane and I have not had any time for crafting these past couple of days. Soo.. I am going to post a card I am quite proud of, I did not make it however my son did. It has a little wear and tear on it because it has been saved and pulled out of hiding a number of times and my camera skills again come into question. I am so happy with this card, I don’t mean to toot horns but I like it. One of the blogs I visit had done a card with C.C. Designs Digi Downloads and it was so cute. 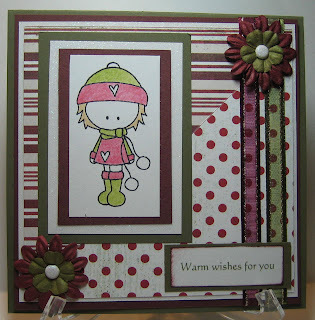 Anyone who visits my blog know that I have done a few cards with designs created by my sister Barb Derksen. So when I saw these cute little digi’s I was a bad girl and brought them and wanted to make a card right away. My camera skills leave alot to be desired but you get the idea. Supplies: C.C. 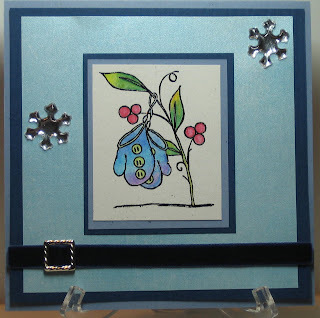 Designs – Hats snow bunny, burgundy and sage from Nature Preserve Recycled cardstock, DCWV- Clear Glitter paper, Basic Grey Figgy Pudding Kringle Designer paper, Celebrate it Holiday ribbons, Prima flowers, Glitter brads. I can’t wait to try a few more of the ‘digital stamps’, hopefully more created by my sister. I am down to my last few pieces of Nature Preserve Recycled Cardstock, I love this paper I brought it at Michaels in the summer on clearance. I don't think they carry it anymore which is a shame as I love the colors. 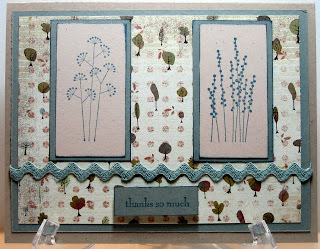 This is a quick Thank you card I put together the night, it was a must do so that husband could deliver it. I was not feeling very creative at all but I know I wanted to use the cherry blossom stamp, and I had already colored it. The cardstock and designer paper must have changed 4 times, I think I am satisfied with the result though. Supplies: Brown and mustard cardstock, Designer paper by Memory Box – Provence Collection, Rubber Stampede – Cherry Blossom, Stampin’Up – Pocket Silhouettes Thanks so much, Gold Ribbon, Kaiser Scrapbook Sage Rhinestone. The picture is not very good, I did not use the stand so that it would not hid the rhinestones or the sentiment. It is all so leaning back so the image is darker at the bottom and now that I look at it as I type it looks all out of wack with the alignment?? To late to retake the picture the card is long gone, I know it was not crooked *sign*. ok I admit it is a horrid picture, what was I thinking. Guess you will just have to trust me that it was not half bad. This is another of my Christmas cards I sent out. 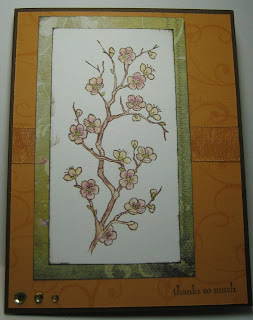 It was the first time I was trying out my Stamp-a-ma-jig from Stampin’ Up. I wanted to overlay clear embossing power to give it a sparkle, in this picture it distorts the image slightly on the card itself it does not give the same blurred look. Supplies: Natural, burgundy and sage from Nature Preserve Recycled cardstock, Paper Bag Studios- Lone Tree, Designer Paper Basic Grey Fruit Cake Pine Branch, Misc gingham ribbon, Ep oxy Sticker. Baby it is cold out there… Well cold for our little corner of the world. Just a quick post today. Another hybrid card of sorts. My sister created this cute little cat image for me for a friends birthday. 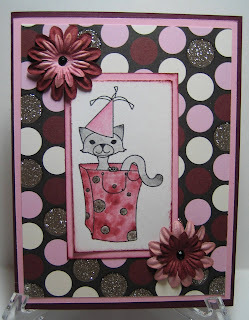 Supplies: Party cat in a bag – Designed by Mrs. Miles, Burgundy and Pink cardstock, DCWV All dressed up designer paper, Prima flowers, black gems. I am back, with a Tag not a card. I wanted something super basic to attach to a box if chocolate for my son’s music teacher. I sent a Christmas card last week (silly me did not take a picture though). My sister was my hero again and rescued me after my pleas for help and made me a little music note with a Santa hat. 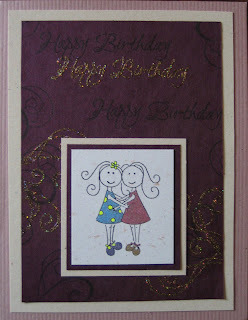 Take a look at her blog and you too could have this wonderful little design as my talented sister is giving it away. 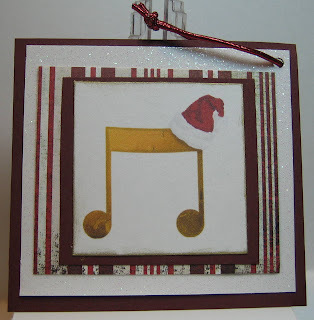 Supplies: Music note image design by Mrs. Miles, Burgundy cardstock from Nature Preserve Recycled cardstock, DCWV- Clear Glitter paper, Figgy Pudding Kringle Designer paper. Unknown elastic cord. OooK, so 2 to 4 cm's not so much, more like ½ foot of snow. The snow is pretty but the nasty little wind that is blowing is not. No card today just a few pictures from a walk this morning. The wind has blown the snow around so it does not look like very much. 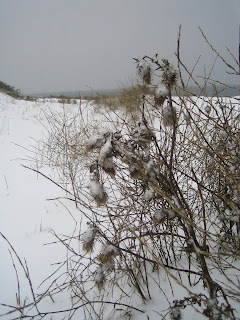 The pictures are a little gray, but it was very gray out and it did not help that it was still blustery and snowing. 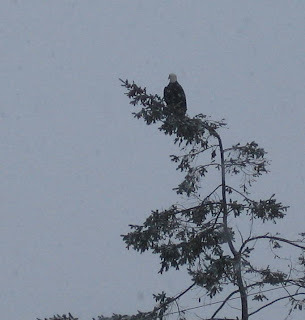 We saw an eagle with breakfast and a second eagle in hot pursuit, we did not get that on camera but we did get a picture of the second eagle after he gave up the chase. We are also a couple of different clubs of seals feeding, there must have been some food in abundance because the seagulls were also actively feeding. They were too far off shore to get a good picture though. It was like something out of National Geographic. Husband was click happy today (go figure) so a couple scenic pictures below. 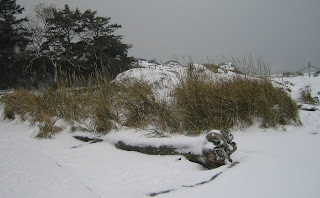 Morning one and all, no Saltspring today (little dance) fields are closed due to rain not snow *sign* snow only tipped the mountains and did not make it down to us. Maybe tonight (fingers crossed) . 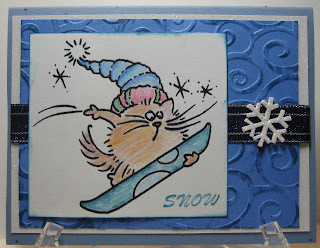 Today’s card is a one of that I made for a friend who loves cats and cartoons so Fluffles works puurrrfect. Her birthday is just around the corner so he might come to the rescue for that card too. Supplies: Blue speckled, blue cardstock, DCWV- Clear Glitter paper, Stampendous -Snowboard Fluffles, unknown snow stamp, Craft Narrows Ribbon, foam glitter snowflake. 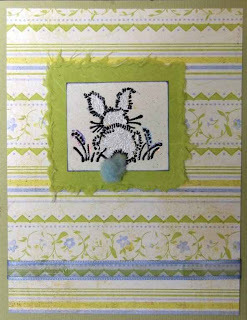 I sat down with Fluffles in mind for card but I was not sure what I wanted to do which his cute little self. I am still on the fence whether or not I like this card. My son seems to like it thou gh. Friday… I am doing a little happy dance. I made a few cards last night… sorry no peaking yet. 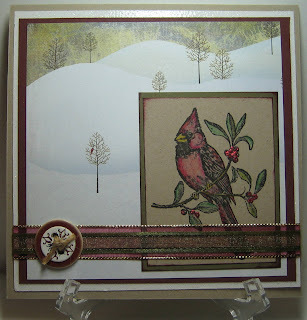 I also did some finishing up on some other cards, the in-laws Cardinal card needed a matching insert and envelope. I also finished packing some parcels to put on the bus. So today’s card is another in the Christmas card arsenal. The color is not quite accurate in the picture, I think the only thing that really looks the same is the iridescent embossing powder. Even the little gems look a little dull. Husband has decided that I do ‘fine’ with the camera and that he is not needed. The one card he took pictures of was this huge production and you would think it was brain surgery *sigh*, so much less stress to fight with it myself. I found a link someone had posted to make a light tent out of a cardboard box and some cheap white fabric, I don’t remember where I found it and I curse myself for not saving it. It will pop up one day when I am not looking for it and then I will share. Enough rambling, on with the card. 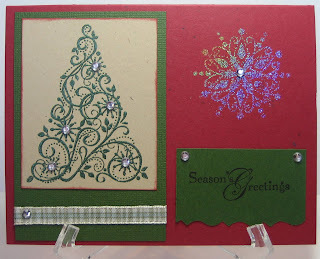 Supplies: Red speckled, green cardstock, Stampin’ Up! -Snow Swirls stamp, Stamp-n Stuff Kaleidoscope Embossing powder, Offray My Moments Petite Gems, Celebrate It Holiday Ribbon. 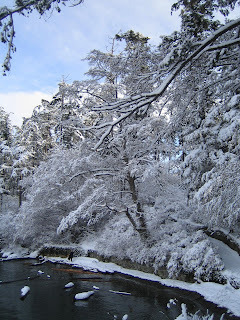 I am off to Saltspring island tomorrow so I am not sure if I will get a chance to blog but will try just the same. We are expecting snow…. 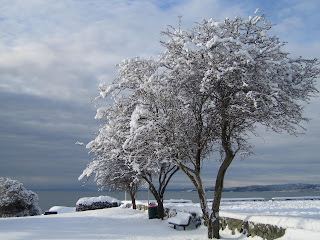 a relative blizzard for Victoria at 2 to 4 cm.. so soccer might be canceled and I could make cards. Morning one and all, no card making for me last night, not a one. 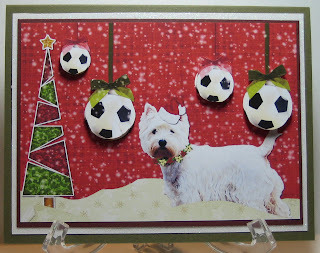 The card I am posting today is a join task card mostly created by my sister Barb when I begged her to make me a soccer ball ornament. What I ended up with is this amazing card. The little soccer balls are popped up with foamies for a 3-d look but you can't see that in the picture and my little camera is not able to get close enough to take a picture of that. My son's soccer coach has a little white scottie dog that plays soccer, when he/she is at the field there is always a soccer ball attached at the nose. Great moves too. I hope 'Coach' likes the card. Supplies: Image and card design by Mrs. Miles, Digital paper background by Louise (LouCee Creations) You can find LouCee's kit at her blog by clicking HERE. 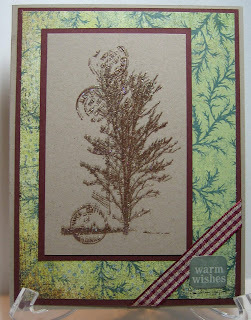 Burgundy and sage from Nature Preserve Recycled cardstock, DCWV- Clear Glitter paper. Wednesday.. it is Wednesday right. Ugg I am so lost for time right now *smile* I need another month before it is Christmas. I did get a good chunk of cards in envelopes and ready to go last night thought (happy dance). Visitors, I have had some wonderful visitors who have come to take a look at my blog and leave great comments, thank you thank you. As soon as I catch my breath I will respond.. This is another of my Christmas cards so for anyone taking a peek at my blog and happen to get one in the mail too, I hope you like it. Supplies: Cardstock- Navy Blue, Silver and Blue specked, Digital Designer paper – Designed by Sillybirdnut, Inkadinkado –Snowman, Celebrate It Holiday Ribbon, Large snowflake brads, Foam Glitter Snowflakes. Just a quick post today. This is one of my Christmas cards I have created. 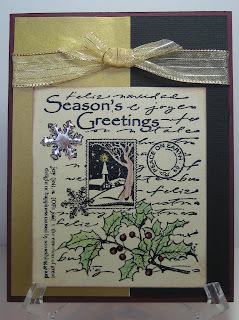 Supplies: Burgundy, black and Natural Cardstock, Gold Paper, Hero Arts – Collage Season’s Greetings, Offray Ribbon, Snowflake brads. Then we were back at Monday… I hope everyone had a wonderful weekend. I am sooo not ready for Christmas. I think I spend 6+ hrs yesterday wrapping gifts for shipping and finishing off some cards to send and after all that I don’t feel any more prepared for the holidays then I felt last week. I took pictures of some of the Christmas cards I have made I am not sure if I am going to post them or not. I probably will as I am running out of card images to share and I am not making them that fast. This card was a very quick card to say thank you to my in-laws. I made the mistake of scanning this card rather then taking a picture of it. One of the flower petals was bent and it does not show any of the sparkles or little details. 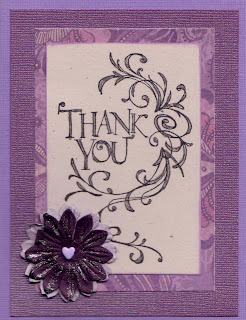 Supples: Purple cardstock – Unknown company (both shades), Designer paper – Costco slab (unknown company), Inkadinkado Stamps – Flouish Thank you, Forever in Time-Paper flowers, Deco Just Glitter Pen. Happy Sunday – Today’s post is going to be quick. This card was made for my husband’s nephew, I love how he just casually asked me to create a card in such a short period of time amidst Christmas preparation craziness. Can I say no... not at all :). 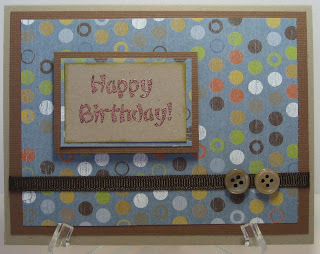 Supplies: Brown Cardstock, Kraft Cardstock by Stampin’ Up, Designer paper- Deja Views Small Polka Dots, Happy Birthday – Rubberstamp Ave, Offray – Brown Ribbon, Misc tan buttons, Jo-Ann Craft Essentials Copper Embossing powder. I would like to send out a huge Happy Birthday to my brothers Bill and Barry, have a wonderful day. This is the card that I put together for this special occasion. I have to say I don’t recall the ribbon looking that skewed when I made the card, can the camera lie? I was aiming for basic, masculine and I really wanted to use the lighthouse stamp by Inkadinkado. 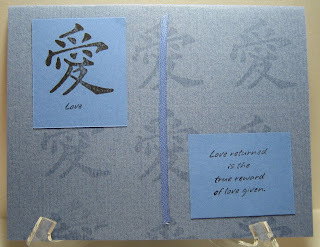 I have changed from listing the supplies that I use to make a card from Recipe to Supplies because I don’t know who makes any of my card stock, only a few of my cardstock pieces have a sticker on the back indicating who makes it. I stock pile my cardstock and designer papers I have a few favorite stamp\scrapbook stores and for whatever reason I seem to always come home with cardstock or designer paper, and I have a ton of it and with that in mind *smile* when I find a stamp I like I sometimes can already see a card forming in my head and it would be such a shame if I did not have the cardstock or designer paper that would work. 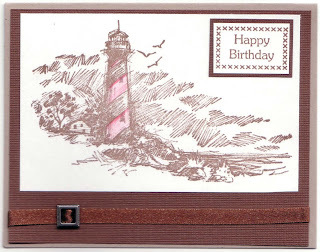 Supplies: Kraft Cardstock by Stampin’ Up!, brown cardstock (company unknown), buckle, Celebrate It Holiday Ribbon – Brown, Lighthouse-Inkadinkado, Happy Birthday-unknown company, Versafine Vintage Septia. TGIF, I have the song ‘ Working for the weekend’ running through my head. I am rushing my way through time again, I hate it when I wish time away. My son had soccer practice last night so that takes about a 2 hr bite out of my creative time. So I did not make anything new but I did tackle some stuff off the to do list I have started to keep on the desk. So this card was made with a twin earlier in the week. I saw this stamp when I went to a local stamp store looking for a Season’s Greeting stamp. I did not get the stamp I was looking for but found a number of other goodies for my basket, I love this little mittens stamp and I thought it would work perfect for the cards I wanted to make for my friends with babies. 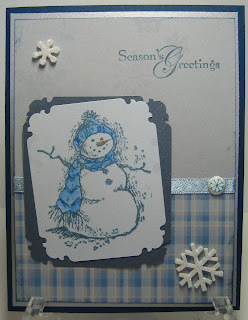 My husband though this card was a little bright but I wanted a frosty style card to support snugly mittens. The designer paper has faint snowflakes on it, this image does not do it justice. Supplies: Blue specked cardstock, Navy Blue Cardstock, Designer paper – Bo bunny Jack Frost Crystals , Velvet ribbon, Elegant ribbon slides- Paperwishes, Plastic snowflake, color with water color pencils. I was chatting with my sister last night getting her opinion on which card to post today and she expressed an interest in cardmaking with me. I would love that, she has tried many times to draw me into her digital world. Alas I fight a good fight and she as only managed to seize a finger or two in her efforts. I love her digital images, and scrapbook kits they are wonderful and my sister has this amazing talent but I have to say I love the glue and glitter on my fingers when I card make. I can't feel the gritty little mess through a computer monitor, it does not help that I really don't love my computer at the end of the day after troubleshooting for others all day. Thus said, I did use some digital papers for some of my Christmas cards, my printer was not happy with me when I printed them out :) but at the end of the day I was. Enough of my gibberish, on with the card. This card was made over 2 months ago, I had most of it made with the exception of the name. One of my best friends was expecting so I was all prepared with the card and a treasure filled box to send. She had at that time narrowed down the baby names to either Haley or Maya so I printed out a little square for each and... well her sweet little peanut was welcomed as Raina. After my little spiel above, I thank my computer, Microsoft Publisher and A Yummy Apology font for the re-print. This was my week of onesie love. I am still trying to talk my husband to take over camera duties, so I apologize for the darkness of the image, it really does not show the little spits of glitter (again with that sparkly stuff). Wednesday already, where does time fly. I have a list as long as my arm for cards that need to be done. I also have the list in hand for my Christmas Card swap recipients and I am going to start sending those out this weekend. I guess family and friend should be on that list somewhere too ;). This card is one that I made for my in-laws, my mother-in-law loves Cardinals. She has two that visit every year that she has named and she can talk for hrs about the birds, so every Christmas there is usually something given to her that has cardinals in some form. My husband wanted a very basic card but I tried to fit a little splash in here and there. You can't see the glitter cardstock base but it is there doing a little twinkle now and again. I love the Memory Box designer papers, I ran across them one day online and ended up ordering 5 different collections of the 6 x 6, they almost tell a story all on their own. The Glitter glue did not quite hold its form after I used it for the holly berries but it still worked out ok. I doubled up on my ribbon to add more dimension to it and I love these die cut buttons I found at Dollar Giant, they jumped out at me as I walked by and I want to use them on everything, they have just a touch of glitter to make them sparkle. For someone who claims to not think much of glitter I seem to be using an awful lot of glitter type items lately. Thank you to everyone who has stopped by and left comments, it is appreciated. I have a few email addresses that have been sent to me and I have not ignored them I just have not had the time to type something up. My sweet sister was kind enough to find this Easter card and take a picture for me to post. Too much time has passed for me to remember what I used to make this. The little bunny tail is a little skewed but it is cute. Welcome to Monday and Happy Dec 1st. I am officially behind in the multitude of cards I need to have completed before Christmas. I was looking through some of the pictures I have taken of the cards from my card swaps and they are either blurry or the colors displayed due to proper lighting just don't even come close to a good representation. This is a card I made for my sister-in-law for her birthday. Sorry no card recipe for this one.